taunt | Stella!!! A Blog About A Schnoodle!! Stella!!! A Blog About A Schnoodle!! About Stella’s Mama (And Papa)! I’ve told you how badly Stella wants to get hold of the squirrels in the backyard….and she also wants to tango with the groundhog that dug a little hole under the fence to get to the neighbors pear tree??? 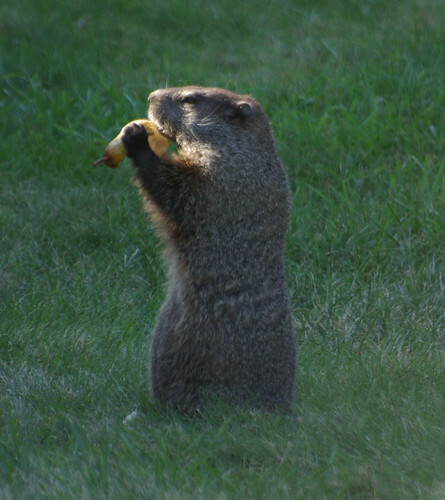 This is what the chubby little groundhog does...stands on his chubby back legs...eats pears....and taunts our dog. Here’s a little video of her in the yard…..
She slowly, slowly slinks along the garden…..to take a look behind the garage….where the groundhog hole is…and then checks the fence….the day I taped her…there were no furry things taunting her in the yard. The other day…..the Schnoodle just about blew a puppy gasket when I took her out into the yard…..she stalked her way into the backyard in her usual stealth manner. There he was….just on the other side of the fence…Mr. Groundhog…with a nice pear in his mouth. He was just at the hole he dug under the fence…. Stella was shaking with excitement…..he looked at her…..she glared at him…and he must have figured…”I can take that Schnoodle.” and he raced through the hole and ran under the neighbors garage. Stella went BONKERS! 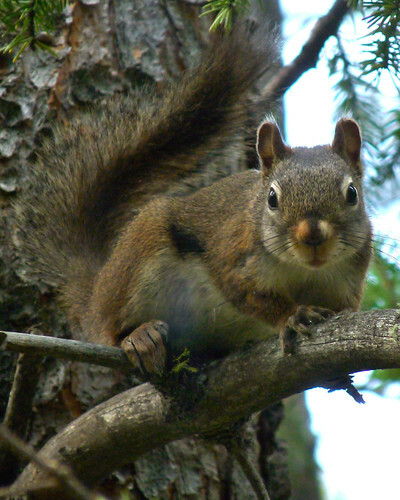 As she’s dancing around on her hind legs…she hears a noise in the trees….looks up and there’s a squirrel…. Ha! Ha! You can't catch us....you can't catch us!!!!!! She nearly lost her little mind….and could not understand why I wouldn’t let her off the leash. Her mission (to go to the bathroom) was totally forgotten and the spaz had to go back into the house. Yay for technology.....Enter your email address to subscribe to Stella's Blog and get an email when Stella's got a new story!! We're getting all fancy in 2010!! Yes Please! Sign Me Up!! 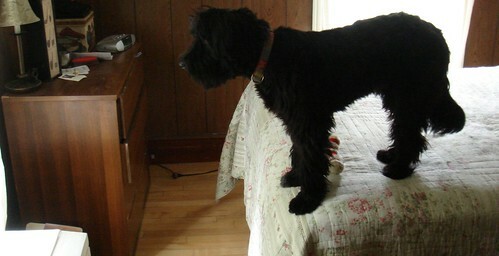 About Stella dog dog blog dogs Funny Random Rescue A Dog Sadie schnoodle Stella on the Web! Please Click Once A Day to Give to the Animal Rescue Site!!! Dog Forum-A Community for Dog Lovers! The Original Portland Daily Photo! Where Stella Goes to Camp! Stella!!! A Blog About A Schnoodle!! · A Blog About A Schnoodle!